Finally my Interceptor 11 arrived in the UK on the weekend after having been in storage in the USA since I bought it 4 years ago. Unfortunately though, I am just not going to have the use for it that I originally bought it for and I am now offering it for sale to someone who will fully appreciate a 1 registered owner, totally rust free Southern California car. It is LHD, has Air conditioning and all original delivery books including the stamped service book as well as the original leather & velour head rest pads and the boot fitted red fire extinguisher. The car certainly looks great and drives very well as I found out on the weekend but it does require light recommissioning with minor oil leaks etc. Also the leather is quite dry in parts but may come up with a decent feed of of hide food. Basically a great project but with NO welding required!! Price wise it is available to the best offer over £20,000. Please click on the following link to see more detailed pics of the car from the dealer it was bought from in 2012. The car has basically not been driven since and has been kept in secure dry storage until being shipped to the UK. The car can be inspected near Leamington Spa in Warwickshire and anyone interested can PM me on here and we can go from there. Last edited by ascotts1 on Tue Oct 23, 2018 5:17 pm, edited 6 times in total. Thanks Grant, Yeah, I actually bought it specifically LHD to leave in France but I have a more regular 5 seat car down there and I only have one car space, so it became a bit redundant but when it arrived on the weekend, I really took a step back and went, WOW to myself, so if it doesn't sell here because of the LHD, I'll just leave it in the corner of my garage here and look at it!! It looks great Scott. I love yellow. my guess that will sell quickly at that price. None of us are getting out of this alive! Original, rust free and just needs a little recommissioning - including a little love toward the leather? That's my sort of car. Good luck with the sale Scott. In 2013 this car required some body repair. Did you fixed this? I think there is a good reason for the low asking price - excellent basis for a full restoration, but definitely in need of such. I am quite disappointed that you would comment that my car is "definitely in need of a full restoration" without having inspected it! 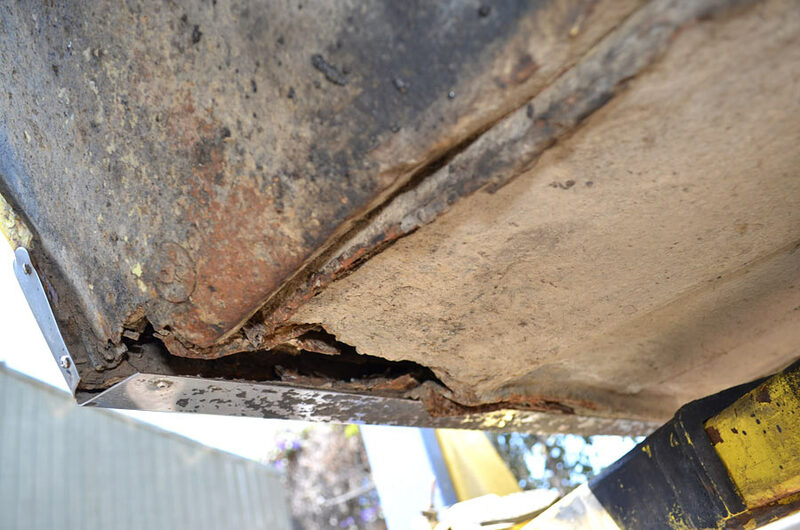 The pictures you showed are indeed quite harsh on the only minor areas where there is any surface rust in the car. After reading your post I actually went out to the garage and had to get down on my hands and knees to find any issues which in the flesh are very minor. 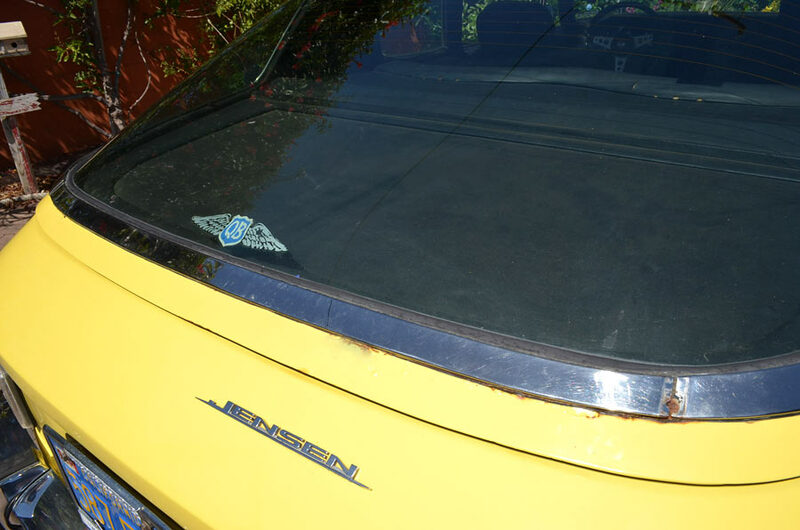 Indeed most Jensen owners in the UK would do cartwheels to have an Interceptor in as solid and rust free condition as this car. 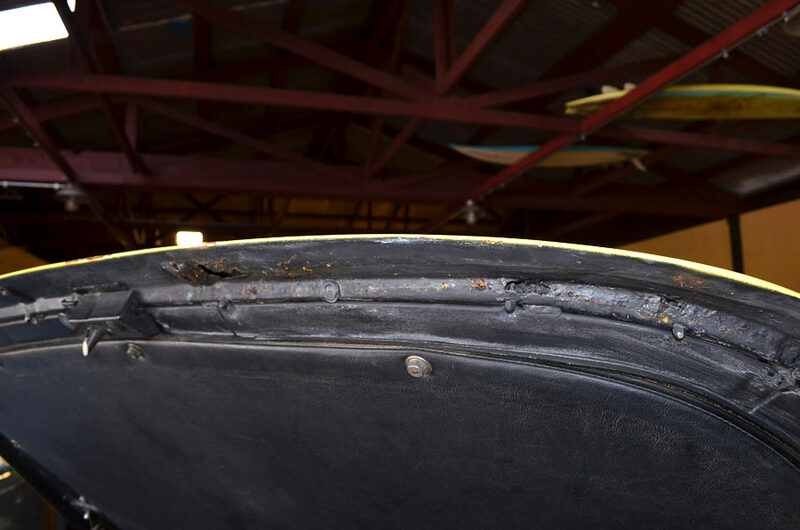 Yes, the underside looks marked as the owner from new until he passed away in 2009 had an enormous farm just north of Los Angeles and as such the car was driven daily over the years on the dirt roads connecting to the highway. However, even things like the original rubberised under carpet floor insulation is there in complete and unmarked form, as is the undercarpet boot insulation. Yes, the car does require some minor work both cosmetically and mechanically to be used comfortably on a regular basis, or if you want a full concourse example, then you can invest as much time and effort as you want or spend £60k+ to buy one in that condition, which is why I said in my original post that it is a 'great project' but in fact it basically drives better than my other Interceptor which is known as being one of the best in the UK and one which I have spent many thousands of pounds on to keep in perfect condition. I have actually booked the yellow car in for a full service and report in the next few weeks and may just keep it as money is not my driving ambition to sell it, as you will see by some of the other cars in my collection ( many more not in the pic as the garage is about to be fully renovated). I actually believe I am doing the members as service in offering this car for sale as it is such an easy project compared to the many horrendous rust buckets requiring a serious amount of welding and new sections that I have seen either for sale or being restored. I also realised after posting that I got the currency conversion wrong as I calculated incorrectly what it owes me in USD then to my native Australian dollars then back to GBP, so the only part of your comments that are correct is that it is cheap at £20,000, so I will now be very weary on who I let inspect the car depending on their price expectation. Please Joerg, if you can find another Interceptor 11 in such solid condition and such well documented 1 owner history,for £20,000, please let me know, my cheque book awaits!!! Car discussion aside for a moment- that is a beautiful, beautiful garage. I‘d move in immediately!! It was not my I intention to “talk your car down”. I inspected it at the dealer years ago in California. Given the fact that you haven’t done anything to it, I suspect that it is still in the same condition. That’s why I say it is a restoration project. An easy and not too expensive restoration, but without it the car will be gone very soon. 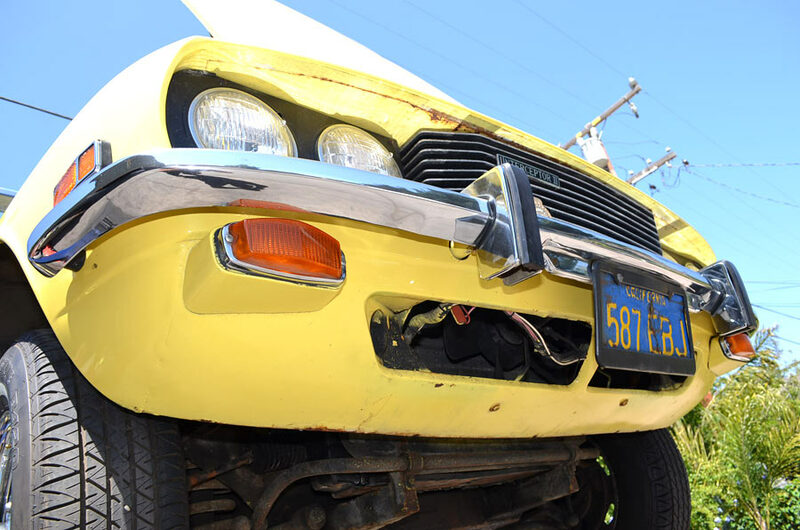 The price you are asking for is fine for a car of that condition and reflects condition and market value, but please don’t stress the term “rust free Californian car” not too much - it will need a lot of work to preserve it for the future ( and I bet that there isn’t much service history either ). luckily for a surviving dry climate car such as this one from California or others from Australia, South Africa, etc, they have never been exposed to salt roads and therefore do not have the horrendous hidden rust issues riddled right through the body structure which is so prevalent in so many UK and east coast USA cars. Which countries use salt on the roads in Europe I am not familiar with. Like most classic car enthusiasts I do not drive any of my classic cars on the winter roads, so assuming the car is left dry stored/garaged, I see a long potential future for it. As I said the original stamped service book accompanies the car with numerous written notes, noting the mileage at respective points by the owner through the years but no, a complete invoice history of servicing since 1971 is not included but generally speaking just having the original Jensen supplied owners manual and service book is gold enough. Ok, not a "totally rust free car". Now with "minor areas with any surface rust". currywurstcarpaccio wrote: Ok, not a "totally rust free car". Lol!!! We must be talking a different car or you brain surgeons with old pics must have taken them prior to me buying it 4 years ago as clearly there are no underbody holes in it now and little if any evidence of where they may have been, as I just went out to look under at it again, thinking I must have missed something but no, not there. 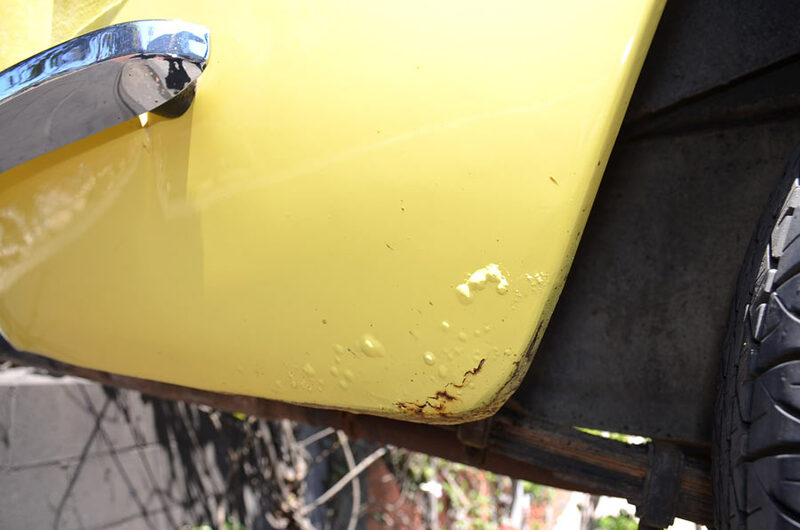 As for rust free vs surface rust, I consider any area of metal with can be lightly rubbed down, primed and painted to be rust free, or in the course of a repaint on a 48 year old car, small areas of metal preparation is acceptable. Where you have to cut out major sections of body work and weld a lot of new metal in, I consider rusty, I guess it's just what your own ideas are?? For you critical Germans, I recite that many, many years ago I went to get a scratch fixed on my mothers 10,000km Australian delivered and PERFECTLY maintained 560SL Mercedes at the time, only for the repairer to point out a rust hole under a rubber seal where the soft top cover closes, so a minor repair, paint and all fixed. Does that make it a rusty car? No, it was almost new all over, it just happened to have 1 rust spot. Last edited by ascotts1 on Thu Oct 25, 2018 6:01 pm, edited 2 times in total.